& recipient of the National Sports Leadership Award 2004. THE venue was the Rubber Research Institute cricket oval in Sungai Buloh and the game being played that day in the National Cricket League was between Kuala Lumpur and Negri Sembilan. It was a day in June 1992 and I could not turn down a request for a meeting by prominent educationist, cricketer and national selector Datuk Abdul Aziz Ismail. Apart from being known as a no-nonsense selector, this Deputy Director-General of Education who was to lose his life to cancer a year after that eventful date was also passionate about the development of cricket in this country. Also called to the meeting was outstanding KL and national wicketkeeper Mohd. Harith Abu Baker. The intent was simple yet crucial to the future of cricket: to revive The Malay Cricket Association of Malaysia which was formed in April 1950 but deregistered in 1978. That was the message that eventually found space in the sports pages of the local newspapers, prompting enthusiast Zahari Suradi from Shah Alam to write in Utusan Malaysia that he was in total agreement with Aziz and that the move was indeed timely. I subsequently called for a general meeting at the National Press Club on August 21 the same year that was attended by 21 people. The master of ceremony was my Utusan colleague and former president of the National Union of Journalists Che Yazid Che Seman. An unexpected but most welcomed attendee was Abbas Ahmad Tambi, the association’s secretary for 25 long years, from 1950 to 1975. During his time with Malayan Railway, one of Abbas’s most appreciated contributions was in being able to secure discounted tickets for players who mostly travelled by train in those days. Sadly Abbas died 12 days after that meeting but not before he had given me a copy of a souvenir programme of a game during his time as secretary. Amongst others at the meeting were Mohd. Harith Mohd. Shariff, a former council member of the association who is currently the manager of the national Under-15 team, and his siblings and also Hasan Abdullah, formerly an assistant secretary and presently a council member. The decision was unanimous. Revive the association. Once this was done the call was for us to immediately also revive inter-state competition for the Rulers’ Shield that was started in 1951 and also the North versus South game that was introduced in 1967. Aziz had a nostalgic link with both competitions, especially the Rulers’ Shield because he holds the record of scoring 139 runs not out in 1968. The main officials were Aziz as president, Rosmanizam Abdullah as general secretary, Zahari Suradi as financial secretary and Che Yazid, Zahani Ahmad (now Datuk) and M. Noor Ishak as ordinary council members. The association’s registration was eventually approved on June 4, 1993, but by that time sadly Aziz was in a critical condition and could not be told of the good news. He died days after that. The prime-movers of this move to revive were however never in dispute before and after the registration that a highly revered personality had to be found to lead if the association was to gain a foothold. 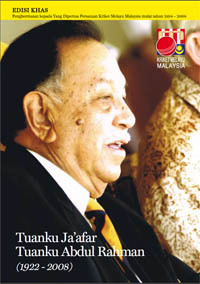 Thus at the first annual general meeting at the Istana Hinggap in Seremban on March 20, 1994, the Yang Dipertuan Besar of Negri Sembilan Tuanku Ja’afar Tuanku Abdul Rahman kindly consented to become the president. Who could dispute the appointment when the Ruler has always been known to be a full-blooded enthusiast who had also captained the Perak team that had won the Rulers’ Shield in 1952 and 1953. The rest of the office-bearers were Zahani as deputy president, Rosmanizam as general secretary, Hasan as deputy secretary, Zahari as financial secretary, Mohd. Sham Jalil as deputy financial secretary and Nazeli Jaafar, M. Noor, Jaafar Abdullah, Mohd. Harith, Che Yazid and Kazaruddin Kamarudin as council members. Tuanku Ja’afar graciously contributed MR1,000 to start fund the association’s activities when the officials had an audience with him three days after the meeting. For a start the North versus South match was revived as an annual fixture, with the first game played in September at the KL Padang. South were victorious but more significant perhaps was the fact that the game brought together again well-known names in Malaysian Malays cricket like entertainer Datuk Mohd. Daud Md. Hashim, Ismail Ali, Kasim Aris, Bakar Said and Zahani. This was followed the next year by the Rulers’ Shield competition which had the participation of eight teams and played at four venues. Johor became champions after beating Kuala Lumpur but another milestone was the willingness of Hicom and Resorts World Berhad to participate as sponsors. The competition has remained as an annual event to this day. It was also in 1995 that Malaysian Malays decided to participate in the second division of the National League, which it came out tops. Promotion to division one was the next inevitable step. More success followed. This time the team won the national 50 overs competition and made the semis of the national league. The success in the 50 overs format was repeated in 1998. The following year Malaysian Malays won the national division one title while in 2000 and 2001 the team became double champions. The association then took the unprecedented step of offering contracts to former national captain Suresh Navaratnam and big hitter Yazid Imran. The presence of contract players from Sri Lanka also helped to enhance the competitive edge, no doubt. The idea to include non-Malay players was mooted in 1997 when the North versus South fixture decided to include a match-up for the youth sides. Current senior national players Rohan Vishnu Suppiah and Krishnamurthi Muniandy were amongst the players who represented the North Youths who won the Milo Shield in 1997. The inclusion of Sri Lankans Thushara Kodikara, Sarath Jayawardhana, Kapila Silva and Priyankara Wickramasinghe was also intended to help train the age group teams and primary school students to develop an interest for the game. Through the years development regardless of race has always been in the forefront of the MMCA, leading to a series involving teams competing in the Under 12 category for the Tan Sri Ahmad Sarji Trophy, so named after enthusiast and former Malaysian Chief Secretary to the Government. Eight teams under the Young Cricket Development Programme took part in a 15-over format which also offered a prize money of MR5,000. The teams were Kuala Langat, Seremban, Penang Sports Club, Bachang (Malacca), Johor Bahru, Sungai Petani, PJ Club and Kampung Gadong. The following year saw an additional four teams in the form of Kuantan, Felda Redong, Gemencheh and Ipoh. In 2001 the association received much needed support in the form of a sponsorship from the satellite TV provider Astro. This programme for youth now has 17 centres, with the best 12 teams competing for the trophy. When officials noticed an improvement in the standard of play they decided a year later to expand the format to 25 overs. Although the centres for development had increased to 20 the competition was restricted to the best 10 teams so as to enhance the competitive spirit. The year 2002 also saw a drastic change in the national cricket scenario. A change in format in the national league meant that Malaysian Malays could no longer take part. But more significant to those behind the association was the fact that the seeds of development were beginning to see results. Two national centres were formed – one at the Victoria Institution in Kuala Lumpur and one at the Penang Free School – and two fulltime coaches recruited from Sri Lanka to train both secondary and primary students. The National Sports Council, which had long been monitoring the association’s development programmes, decided to assist in terms of the training and exposure to competitions. It must be noted here that the development programmes were intended to benefit players of all races. Players who show potential at the Under 12 level are then placed either in VI, PFS or the Bandar Penawar Sports School in Johor. These three centres of excellence now have almost 100 players under the guidance of fulltime coaches. With success and well organised programmes comes sponsorship and since 2002 the association has been able to send both secondary and primary students for training stints in Sri Lanka, Australia and South Africa. Sponsorship and government assistance have also been responsible in allowing the association to organise the International Malay Cricket competition for both seniors and youths, the Under 15 Tuanku Ja’afar International Trophy played with Sri Lanka and Bangladesh and the Golden Hope Under 17 involving also Sri Lanka and Bangladesh. To the association the ultimate satisfaction is in seeing the age-group teams benefiting from its development programmes. Seen from a wider perspective these programmes are intended to assist the country improve its position in terms of the world cricket ranking and not solely for the association per se. As proof of the success of the MCAM’s development programmes, over 75 per cent of the association’s representatives are now in each of the national teams for the Under 13, 15, 17 and 19. For all that we have achieved thus far the association will always remember the roles played by former NSC Director-General Datuk Wira Mazlan Ahmad for his unwavering support in my belief in developing the game in the country through the MCAM. This support was to continue under his successor Datuk Dr. Ramlan Aziz and Datuk Zolkples Embong. Another high for the association has been the setting up of the Bayuemas Oval. But it was never planned to be that way. In fact it started with a sketch from an association member, Mass Yusoff of Utusan Melayu, that was printed in the 1999 annual report. This “idea” was never discussed further but unknown to many, it had caught the attention of Tan Sri Sarji. He then spoke to the then Group CEO of Golden Hope Plantations Berhad, Datuk Abdul Wahab Maskan. Within the same premises now also stands the Tuanku Ja’afar Malay Cricket Academy. For me personally the hope is to see everyone, including the Malaysian Cricket Association, working together to help Malaysia achieve “developed” status in world cricket and ultimately be recognised as a Test playing country. We are fortunate to have both the MMCA and MCA working as one towards this goal.